A foundational Holy Land map. Tribus Neptalim videlicet, ea Terrae Sanctae pars, quam in divisione regionis tribus Neptalim accepit. 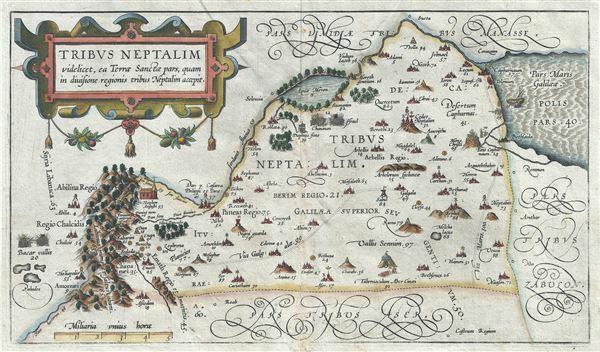 A fine example of Christian van Adrichem's rare 1590 map of the lands granted to the Tribe of Naphtali at the time of Joshua's division of the Twelve Tribes. The map is oriented to the east and covers form the Sea of Galilee northwards along the Jordan River as far as Lebanon and the Golan Heights. Naphtali was part of the Kingdom of Israel until its lands were conquered by Assyria in c. 723 BC and the population deported. Since that time it has been considered one of the Ten Lost Tribes of Israel. Numerous Biblical sites are noted including the Mount of the Beatitudes at Capernaum. This map is the seventh of ten maps of the Holy Land prepared by Christian van Adrichem for publication in his Theatrum Terrae Sanctae. Adrichem's maps for the Theatrum were prepared between 1580 and 1585, but were published posthumously by his associate, Gerardis Brunius of Koln, in 1590. The publication went through several later editions and served as a basis for most subsequent maps of the Holy Land well into the 18th century. Christian Kruik van Adrichem (February 13, 1533 - June 20 1585), alternatively known as Christianus Crucius Adrichomius was a Dutch theologian active in the second half of the 16th century. Adrichem was born in Delft and was ordained in 1566. He served as the director of the Convent of St. Barbara in Delft until expelled by the Protestant Reformation. Fleeing the anti-Catholic sentiment of the Reformation, Adrichem reestablished himself in Cologne (Koln) where compiled various religious works including his important historical atlas, the Theatrum Terrae Sanctae et Biblicarum Historiarum. Adrichem's important atlas was published posthumously by his associate Gerardis Brunius in 1590. The work went through numerous editions and served as the foundation of most subsequent maps of the Holy Land well into the 18th century. Adrichem, Christian van, Theatrum Terrae Sanctae et Biblicarum Historiarum (Gerardus Brunius, Koln) 1590. Very good. Original platemark visible. Blank on verso. Minor wear and toning along original centerfold. Laor, E., Maps of the Holy Land: Cartobibliography of Printed Maps, 1475 - 1900, #15.